As of today (for January to March 2019 quarter) NSC gets 8.0% interest compounded annually. The interest rates are set every quarter by Government of India and is benchmarked to Government Bond yields. However once purchased the interest rate remain constant for that NSC. The maturity period is 5 years from the date of investment. 10 Year NSC has been discontinued since December 20, 2015. You can claim tax deduction up to Rs 1.5 lakh for investment in NSC under Section 80C. Additionally the interest accrued every year on NSC is also considered for tax exemption u/s 80C. The final year interest is not considered as reinvestment for tax benefit. To take the tax benefit on accrued interest you should declare the same in your income tax return (ITR) form every year under “Income from Other Sources”. There is NO TDS on NSC. The interest earned is taxed according to marginal income tax rates applicable to tax payer. The minimum investment should be Rs 100. There is NO maximum limit for investment in NSC. However the maximum tax exemption is Rs 1.5 Lakh u/s 80C. NSC can be purchased in multiples of Rs 100. NSC can be bought across counters of most post offices. You just need to fill up a one page form and attach relevant KYC documents (self-attested ID and address proof). After due diligence and verification of KYC documents NSC is issued to the investor. The practice of giving NSC certificates have been discontinued since July 2016 and now investors are issued NSC Passbook (similar to bank account passbook) with the investment details. You can also buy NSC online if you have net banking access of Post Office Savings Account! Is NSC available in banks? Government on October 20, 2017 had notified selling of small saving schemes including National Savings Certificate (NSC), recurring deposits and monthly income scheme (MIS) in all public sector banks and 3 private sector banks – ICICI Bank, HDFC Bank and Axis Bank. Since this is new to banks I cannot find the details on their websites. However you can visit banks to know more. This was done to increase the reach of small saving scheme to more people! Who can invest in NSC? Only resident individuals can invest in NSC. You can invest jointly with another adult or purchase it on behalf of a minor. HUFs and Trusts are NOT eligible to invest in NSC. Also NRIs cannot invest in NSC. However if NRI can hold NSC if they had purchased it before becoming NRI. Nomination facility is available for investors. You can nominate at the time of purchasing the NSC or any time before redemption by filling up this form. If required you can also request for change of nominee. The NSC can be transferred from one person by filling up this form. The transfer can be done only once. NSC can be kept as collateral security to get the loan from banks & financial institutions. Fill up this form. 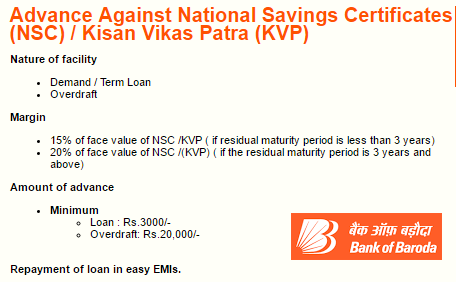 Below is screenshot from Bank of Baroda for Loan against NSC/KVP. You can check terms and conditions here. NSC purchased from a post office has to be redeemed in the same post office. In case you are moving places its good idea to transfer the NSC to a post office near to your new area. You can do so by filling out the prescribed forms. The good thing is the transfer application form can be submitted in either of the post offices. If you do not redeem your NSC on maturity the amount would earn interest of just 4%. This is applicable for two years from maturity. After 2 years there would be no further interest paid. In case the redemption happens within one year of investment, NO interest is paid. NSC a GOOD Tax Saving Investment? NSC as of today offers 8% interest while Bank Tax Saving Fixed Deposits offer 6.5% to 7.5%. So NSC is clearly better than Bank fixed deposits. Additionally the interest accrued every year in NSC is eligible for tax benefit. The only drawback for NSC is ease of investment – you can invest in tax saving fixed deposit online while in case of NSC its offline. However going forward banks have been allowed to sell NSC and we can expect online transactions in NSC in coming future. My NSC of Rs. 60000/- matured on 18.03.18. I wish to redeem it on 02.04.18. For which year ITR I have to show it as income in FY 2017-18 or in FY 2018-19 as the NSC matured in FY 2017-18 but my redemption is in FY2018-19. Although decuction under 80C has been claimed in FY 2012-13 as the NSC purchased on 18.03.13. But, I have neither shown its interest as income nor exemption under 80C. What interest should be payable now ? Thank you so much for the quick response. According to you, I have to pay tax only for the interest earned in FY 2017-18, means for the last year interest only. But, I want to know if there is any problem for the rest of the interest amount earned during the last 4 year but neither claimed under 80C nor shown as “Income from other source” ? Can it be ignored now or there is any solution still available ? Sorry I think there was misunderstanding, you will have to pay tax on entire interest earned from the time of investment till maturity. I have nsc bonds worth 70,000/-. I want to transfer those to my wife. After transfer, those are finally belongs to my wife or to me?. Are they are wiped off from my account?. Are they taxable for my wife or to me? After transfer the NSC would belong to your wife and she would have all the right on it. As per tax on interest received is concerned, clubbing of income would apply and it would be taxable in your hands & not your wife! nsc purchased in Assesee’s name with joint2nd name of married daughter – if eligible under sec-80C investment /exemption of taxable income?